Our partners often tell us that one of the things they value most about working with us is our deep industry expertise that gives us insight into new opportunities that may otherwise get overlooked. Take for example our recent collaboration with ChromaLuxe. 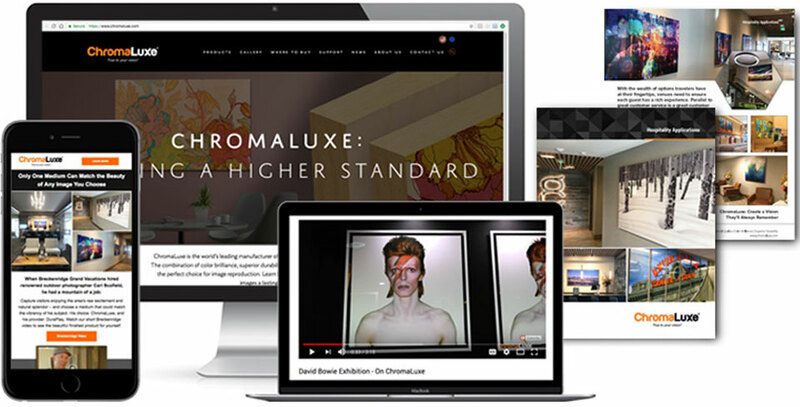 ChromaLuxe, a division of Unisub, is well established as a leading media manufacturer in the fine art and photography markets. Like most companies, where they were challenged was in being able to turn existing projects and successes into compelling stories that would resonate with new audiences – and that’s where HCS excels. We saw the opportunity to not only seed demand with graphic communication companies, but to amplify that demand by introducing the ChromaLuxe product to decision-makers across several specifier channels. This is the core of our Omni Demand-Engine: Creating awareness in the industry that communicates the company’s unique value, and driving end users to request their products directly from print service providers. “HCS has helped introduce our brand to completely new markets with engaging messaging that gets results. They are very easy to work with, providing expert guidance and clear plans on how to get the most out of our efforts. The content created is both creative, and visually appealing. Not only have we seen results in terms of the engagement numbers, but we have seen it in the field at trade shows, events, customer meetings and more. Using HCS has given us the opportunity to quickly reach our goals of creating brand awareness and driving new business opportunities in a new market. This multichannel approach creates the ultimate feedback loop: Specifiers get a great finished product, your clients look great, and your bottom line improves. It’s a win-win-win situation. The HCS Omni Demand-Engine rolls strategy, execution and delivery into one streamlined service. Book a meeting with Clayton Marsh or Brian Hart to Learn More.